Salvatore Alfieri is a founding Partner of the firm and heads the Real Property division of the firm. He practices in the areas of Planning and Zoning, Residential and Commercial Real Estate, Banking, Chancery and Real Property Litigation, Tax Appeals, Municipal Law, Guardianships and Commercial Foreclosure. 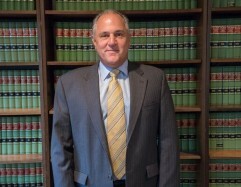 In addition to those areas of practice listed above, Mr. Alfieri currently serves as Municipal Attorney for the Borough of Fair Haven and Special Counsel for tax appeals for the Townships of Lakewood, Howell, Marlboro, Beach Haven and Sea Bright. He previously served as Attorney for the Monmouth County Police Chief’s Association as well as General Counsel and Land Use Attorney for various municipalities. His extensive experience in real property and banking matters has garnered him many notable clients such as The Trump Organization, Edgewood Properties, Cardinale & Associates, LLC, Centex Homes, L.L.C., Kara Homes; K. Hovnanian Homes; Clayton Block Company, Inc.; CCF Industries, Inc.; Anchor Concrete; Costco; New York Community Bank; SI Bank & Trust; First State Bank; First Commerce Bank; Central Jersey Savings Bank, SLA; Fulton Bank and Freehold Savings and Loan Association. Mr. Alfieri has also successfully tried many cases before the Tax Court of the State of New Jersey and has served as guest speaker for the Monmouth County Assessor’s Association. Mr. Alfieri has endeavored to support the community for many years by serving as a Trustee of the Community YMCA – Arrowhead Branch and Monmouth County Boy Scouts. He formerly served on the Foundation Board of Kimball Medical Center and Foundation Board of Collier School. He also sits on the Board of First Commerce Bank headquartered in Lakewood, New Jersey.